A revolutionary hair care range using a combination of 6 Oils to provide complete nourishment for your hair! Be it in Paris or in India, women crave for ‘perfect’ hair that is strong, shiny, thick, smooth, soft and manageable. All these qualities are achievable only with hair that is deeply nourished from within. L'Oréal Paris, the world’s No.1 beauty brand is now making this possible for Indian women with its new 6 Oil Nourish Range giving your hair the nourishment it deserves. 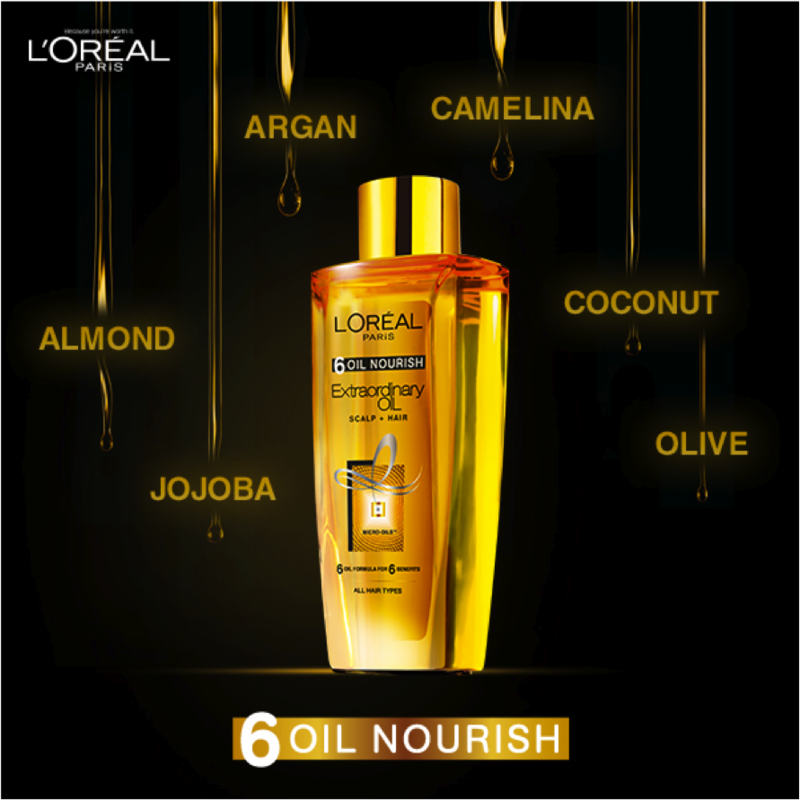 The L'Oréal Paris 6 Oil Nourish range contains a unique combination of three traditional oils – almond, coconut and olive oil; and three exotic oils – argan, camelina and jojoba oil. These 6 unique oils in the range work together, to make your hair strong, shiny, smooth, soft, thick and manageable. The 6 Oil Nourish range includes a shampoo, a conditioner and for the first time ever a unique hair oil from the brand. All three products in the range, aim to provide extraordinary results with instantly transformed hair that you can feel, see and touch from the very first use. This is the first hair care range from L'Oréal Paris that can be used on all hair types and has been specially created by the L'Oréal Research and Innovation Centre in India. L'Oréal Paris 6 Oil Nourish Extraordinary Oil: A unique blend of 6 micronized oils to infuse intense nutrition deep in scalp and hair and provide the 6 qualities of beautiful healthy hair with no heaviness, no greasiness. The first hair oil from L'Oréal Paris is a must-have for healthy, nourished hair that give you an extra touch of glamour. L'Oréal Paris 6 Oil Nourish Extraordinary Oil is priced at Rs. 199 for 100 ml. L'Oréal Paris 6 Oil Nourish Shampoo: This shampoo is created to provide utmost care to the scalp as well as the hair. The shampoo infusedwith 6 unique oils gives you the 6 benefits of nourished hair.The shampoo is priced at Rs. 138 for 175 ml. L'Oréal Paris 6 Oil Nourish Conditioner: A first of its kind from L'Oréal Paris, the 6 Oil Nourish Conditioner can be used on the scalp as well to provide deep nourishment to your scalp and hair. It makes the hair soft, silky and manageable while also smelling fabulous. The conditioner is priced at Rs.150 for 175 ml. Bid adieu to bad hair days and enjoy the benefits of glamorous, nourished and healthy hair all year round with the L'Oréal Paris 6 Oil Nourish Range available at all key outlets. L'Oréal Paris 6 Oil Nourish Conditioner:A first of its kind from L'Oréal Paris, the 6 Oil Nourish Conditioner can be used on the scalp as well to provide deep nourishment to your scalp and hair. It makes the hair soft, silky and manageable while also smelling fabulous. The conditioner is priced at Rs.150 for 175 ml.